Tapas are something I have never really indulged in before. I always thought they wouldn't be very exciting for vegetarians, leaning more towards meat and fish. Well how wrong was I? We were, once we read the menu! 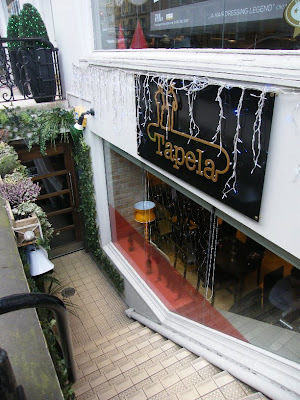 Graham, Cooper and I took a trip to Glasgow to visit the new Tapas restaurant - Tapela. It was a lovely day for a drive and we were really looking forward to our day out, after all the rain we have suffered lately. We parked in a city centre car park, feeling slightly dizzy at the thought of how much it was going to cost us for the privilege of parking there and set of in our hunt for the restaurant. After declaring ourselves no nearer to finding it, we popped into a shop to ask for directions. There was some debate over which way to go and the final piece of advice was to take a number 77 bus. "oh, it's quite far then?" we asked. "Yes, it will take you about 15 minutes to get there". What's wrong with people in Glasgow, have they no feet or are they just extraordinarily lazy? Anyway, we set off and found it wasn't too far to the restaurant. Cooper enjoyed spotting all the buses on the way. We were very impressed when we arrived at the restaurant. 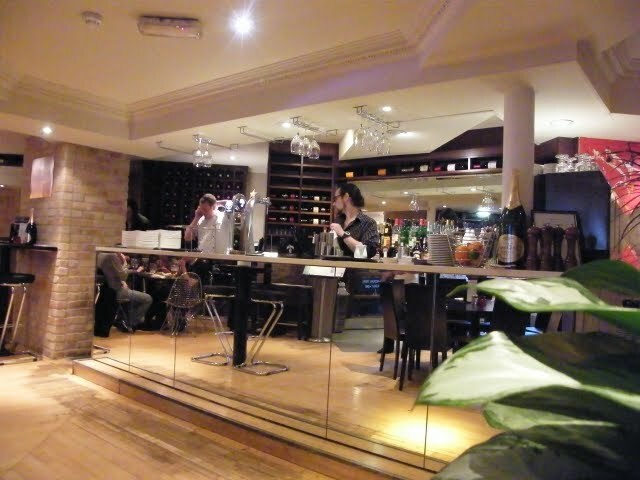 Some lovely latin music was piped into the stairway to welcome us in and get us in the mood for our tapas. The restaurant was very stylish. Muted colours, pale wooden floors and lots of black and chrome. There were flashes of colour with red splashed panels that Jackson Pollack would have been impressed with and some lovely orange lamps. 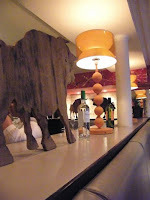 I particularly liked the carved wooden bulls and Cooper loved the water feature in the stairway. 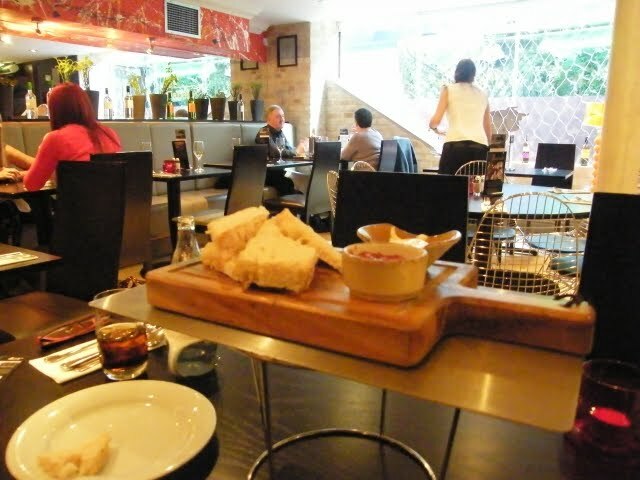 The staff were very welcoming and quickly brought us some drinks and a wooden plate piled with rustic bread and dips. Just the thing to get Cooper onside. He loves all things baked. It took us a while to decide on what to have as it all sounded so lovely and there was so much to choose from. 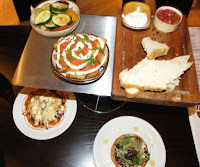 As well as the tapas, they had a main menu too with temptations such as Vegetable Paella with Chickpeas and Aioli and a Thin Mushroom and Picos Blue Tart with Chargrilled Courgettes. Mmmmmmmmmm! They also had a lunch menu with 2 courses for £9.99 and 3 courses for £13.95, but we decided to share a selection tapas before plunging into the dessert menu. We selected the Patatas Bravas, the Roasted Mediterranean Vegetables with Garlic, Thyme & Aged Balsamic, a Goats Cheese and Caramelised Onion Pizza and the Thin Beetroot and Feta Cheese Tart with Roquette and Spiced Beetroot Chutney. 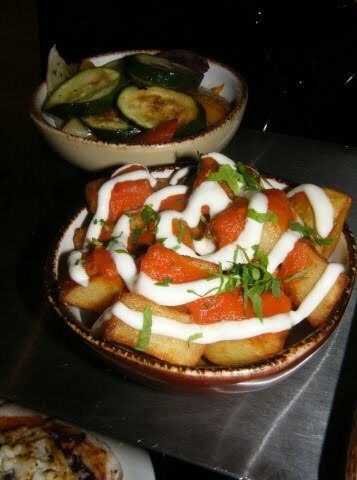 The Patatas Bravas were liked spiced little morsels of roast potato. I could have happily eaten the whole bowl of potatoes myself. The Roasted Mediterranean Vegetables were full of flavour and still had a bit of bite to them, which I like. The Beetroot and Feta Cheese Tart which I was really looking forward to was subtle after the punch of flavours in the other dishes. It was beautifully presented, but a bit bland. I think I would have enjoyed it better on it's own with a salad, rather than fighting for place with the other tapas dishes. And now onto the pizza. Well, we nearly came to blows over the pizza! 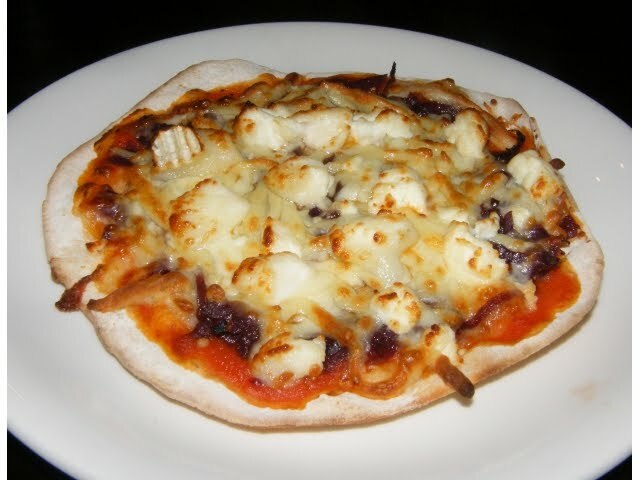 A lovely freshly baked thin base with sweet and rich caramelised onions and a lovely goats cheese that wasn't overpowering as it sometimes can be. We all declared it the best pizza we had ever had. Well Cooper contributed his opinion by smiling lots and asking for more. We shared two desserts. A Vanilla Cheesecake with Berry Compote and Raspberry Sorbet and a Smooth Lemon Posset with Pistachio Shortbreads. Oh my god, they were good! 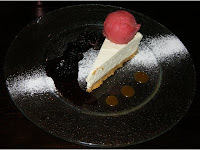 The cheesecake was deep and oh so creamy, but not too sweet. The sorbet was slightly tart as was the berry compote. Just gorgeous! 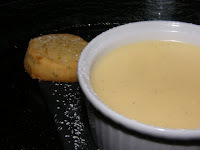 The lemon posset was really thick and rich, but the lemon flavour was not overpowering. You could taste the lemon to begin with, but then the flavour is handed over to the vanilla seeds that are nestled through it. The pistachio shortbread was melting and as light as air. I am pleased as punch to say I came away with the recipe courtesy of their head chef - Gordon Stewart. Although the restaurant isn't geared up for small children, the stairs which are too steep to contemplate taking a pram or buggy down and the lack of highchairs. 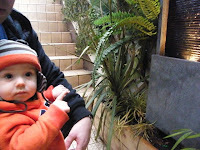 The staff made us very welcome and didn't mind having a wee toddler toodling about. They even tried to get us a highchair from the bar next door. The prices are reasonable too. The vegetarian tapas are between 3 and 5 pounds and the desserts around about 5 pounds each. 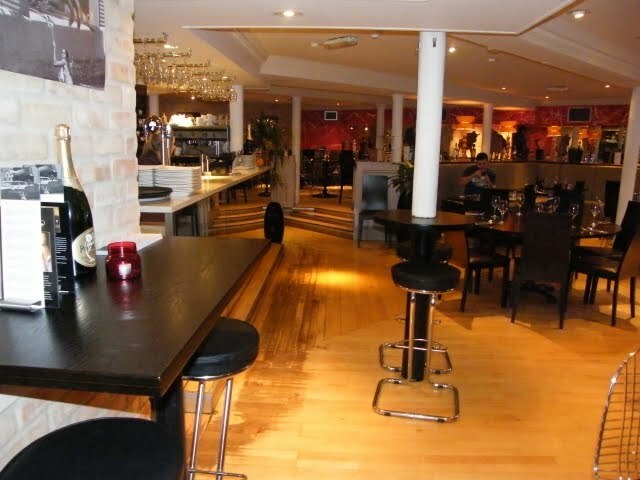 We will definitely make a return visit the next time we are in Glasgow. 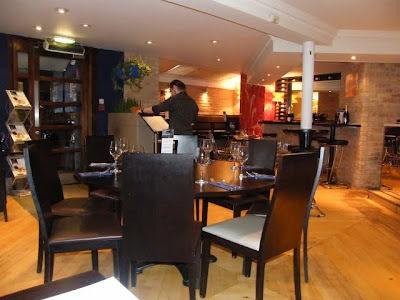 What a lovely looking place and the food looks amazing! Hey Valerie, it was all lovely and totally scrumptious! Hm. Didn't realize we had a new tapas restaurant! We usually go to Cafe Andaluz in the West End - there's one in the City Center as well, but it's usually WELL crowded with business folk. Sorry we didn't get together. We had a wander through the Botanical Garden since the sun was thinly peeping out through the fog -- and now it's spitting snow, so all of that is just a memory anyway. P.S. - next time you ought to park at our place - as Bath is less than a mile from our flat...about an 8 minute walk, I'd say. Looks wonderful! We'll have to give it a try! Truly - Bath is SO CLOSE to us it's not even funny! Jac, that sounds fantastic and a very well deserved treat for you. 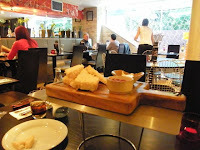 I love tapas and it's always a good choice for vegetarians. It also is good for meat eating CT - he is "allowed" 1 meat dish and we share the vegetarian ones ;-) Not that we eat out very much or that we come across tapas very often. Wow all these dishes sound mouthwatering nad scrumpticious.I never thought so much choice would be available for vegetarians in atapas selection. Mmmm, mmmm, mmmm! Everything looks delicious, I'm hungry and it's time for dinner . . . got to run! LOL!!! Oh how I wish I didn't live an ocean away! Looks and sounds delicious! We love Tapas!! This is my kind of restaurant Jacqueline where I can try a little of everything without feeling too guilty. I love tapas, too. Little dishes, so many things to taste. Looks like a great restaurant, too - you don't find many kid-friendly tapas restaurants! That looks sooo delicious!! Put me in front of a bowl of marinated olives and I'll be busy for a while I always thought tapas (or Spanish food in general) was very fishy and have never really been interested. I am not a vegetarian anymore, I grew up as one, but eat vegetarian most days and always order vegetarian if I eat out. I don't think it is really set up to be a family restaurant Monica, but they were very welcoming and we will be going back as a family. May buy one of those tie-on seats for toddlers. We could have met up so easily!!!! I'll have to add this to my list of eateries to go to when I'm in Glasgow lunching with mates. Everything sounds so good on the menu, think I would have struggled to decide! 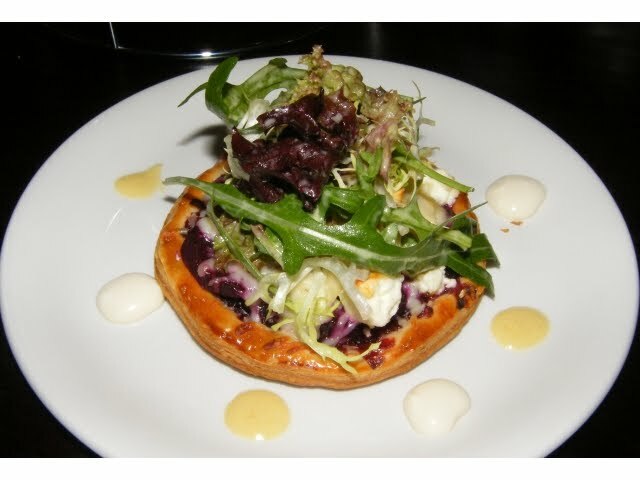 Really like the sound of that mushroom and blue tart with courgettes, all my favourite things together mm! The restaurant looks wonderful...your photos are terrific. But what I like best is your tapas list! Going to make some of those! That sounds so good. Now you have me wanting to visit Scotland to eat Spanish food! hhmmm, you're making me hungry. I love tapas too and hear you on the plate full of patatas bravas. this looks like a lovely restaurant and the food... yum!